Despite periodic media scandals, remarkably little has been written about the everyday workings of the grassroots immigration system, or about the people charged with enacting immigration policy at local levels. Detention, particularly, is a hidden side of border politics, despite its growing international importance as a tool of control and security. Lucy Mayblin found this ensuing volume hugely impressive, both in terms of theoretical exploration and empirical exposition. On any given day up to 2,500 people are detained in immigration detention centres. Some of these people are asylum seekers, some failed asylum seekers, some visa over-stayers, and some foreign criminals who have served a prison sentence in this country. While these centres are carefully distinguished from prisons in political and policy rhetoric, they are closely related, sharing many similarities in terms of remit and practice. Yet the vast majority of detainees in these centres have not committed a crime, nor sentenced in court, and do not know for how long they will be detained. This is a situation which a number of academics have expressed concern and research on immigration detention has been growing in recent years. Within this context, Alexandra Hall’s study is a key publication and essential reading for scholars who research asylum. Border Watch reports on a one year ethnographic study of life in a detention centre (pseudonym ‘Lockston’). In Hall’s words, the book focuses on “the lived meaning, expression, contestation and reproduction of […] boundaries and hierarchies in the everyday routines at Lockston”. A central aim, then, is to “take seriously what people think and believe they are doing in this site”. While the focus of this study is the individuals who work in the institution, their working practices, views, attitudes and experiences offer a window into a much broader set of issues. These include the everyday enactment of social attitudes towards ‘others’, gaps in the human rights framework which act to exclude some from the full suite of rights, questions around the interplay between racism and anti-immigrant sentiment, and the challenges of operationalizing the imperatives of a restrictive immigration regime. Though Hall mentions Agamben’s thesis on bare life in the camp (a popular referent in refugee studies at the moment), it is Foucault’s governmentality, particularly within the context of the prison, which forms the locus of her theoretical framework. Hall argues that the central organising ethos of the detention regime is difference and division. She describes the detention centre as productive of symbolic, systemic and physical violence: “the desire for security reduced the detainees to body-objects, and discourses of indiscipline and illegality produced the detainees as morally excludable”. While daily social interactions between officers and detainees “tended to be conducted in a manner that was amiable in appearance”, they were in fact “designed to maintain brittle power relations… Officers perfected the technique of appearing to treat the detainees well, while keeping an eye on the ‘bigger picture’. The focus on staff in the detention centre allows for the telling of a nuanced story which expresses the banality of life within such an institution from the perspective of those working there. While on the one hand this (to an extent) garners sympathy and understanding from the reader, on the other I found myself enraged by the apathy of the officers with regard to the humanity of their wards. Themes of division and violence (physical, mental, cultural) dominate the book. However, in Chapter 6 Hall investigates moments in which such divisions were disrupted. The ‘ethical encounters’ detailed include a day long ‘Festival of Faiths’ to which outsiders are invited and at which detainees sing, dance and display their artworks and short stories. Yet even this effort at ethical encounter is diminished by the exclusionary practices which define the detention centre. The Festival of Faiths presents the centre as a multicultural melee of ‘cultural others’, displaying a narrative of ‘who we are’ and ‘who they are’ which ultimately conforms to the assumptions held by outside attendees. Hall writes “the benign facade of the Festival of Faiths, then, highlighted the moralised discourses at Lockston which variously recognised the men at Lockston as ‘other’, as ‘detainees’, as ‘victims’, as ‘security threats’. Truly ethical, empathic encounters do happen, however. On one occasion, Hall reports, a new arrival began crying during processing. The receptionist sat him down and he told her that he had been suddenly picked up from his home by the police, that “he didn’t know where he was going or what was happening to him. His girlfriend was pregnant, he continued, and was due to give birth any moment. She would be worried about him, what would she think?”. The receptionist made the decision to allow the man to phone his girlfriend, even though it broke all centre protocols. Another time, after a detainee had hung himself (in anticipation of being deported to his home country) an officer was unable to resuscitate him and he died. Another detainee asked the officer if he was ok, seeing the distress that this incident had caused him. This act broke down all of the usual boundaries which operated within the institution and through this act of empathy, the detainee became more human in the eyes of the officer. 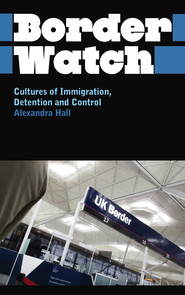 Hall’s Border Watch is a masterclass in the ethnographic case study. She weaves empirical examples from the field with political context and high level theory effortlessly. The book is beautifully written, a captivating narrative which is unusually compelling for a theory laden academic text. At around 170 pages this isn’t a large volume and yet it achieves so much in terms of both theoretical exploration and empirical exposition. This is also an interdisciplinary study: Hall is a political scientist with a human geography background and the study draws on literatures from across the social sciences. As such it will appeal to readers from across the social sciences and humanities. Indeed, to anyone concerned about the hidden practices of the border regime and the implications that a hierarchical conception of humanity and rights have for us all. Lucy Mayblin is a Postdoctoral Research Associate in the Interdisciplinary Centre of the Social Sciences (ICOSS) at the University of Sheffield. More information about her research is available on her website. Read more reviews by Lucy.